to illuminate subjects that most people prefer to ignore. have debated the pros and cons of circumcising healthy male children. In a new era of childrens rights, greater respect for their rights must be accorded. Circumcision of healthy infants and children is not in their best interests. The time to act in the defense of children is now. are doing and how you can help. This site is only occasionally updated, but remains valuable for archival purposes and major announcements. Whether done in the name of family, culture, religion or medicine, genital cutting customs are forced upon normal, healthy children. When imposed on girls, these customs tend to be as severe, or more so, than those imposed on boys. Boys, however, are six times more likely to be subjected to these genital violations than girls. To express concern for individual rights to one's own body, NOHARMM created The Genital Integrity Ribbon in 1998 from a concept developed in 1996 by the late human rights activist John A. Erickson. The colors blue and pink remind us that genital mutilations transcend gender. Although each side is a different color, they are two sides of the same ribbon. Male and female circumcision are also different, but they share many important similarities and are two sides of the same issue - children's rights to bodily integrity and eventual self-determination. Physical integrity and self-determination are basic and universal rights recognized by numerous international human rights treaties. 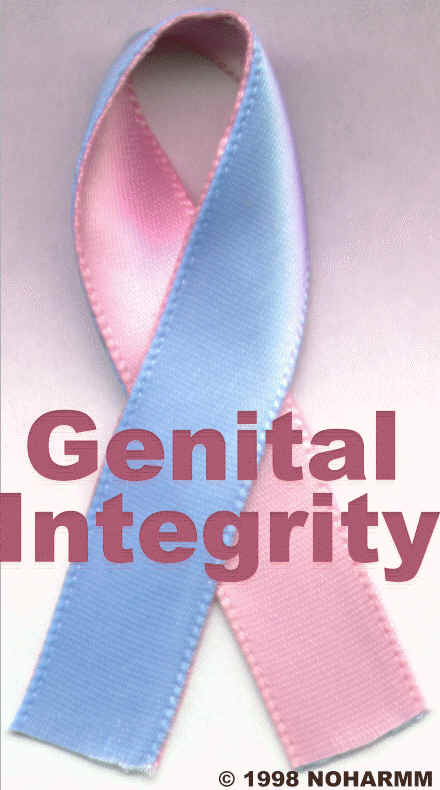 The Genital Integrity Ribbon is a compassionate expression of solidarity among children's rights advocates, as well as a sign of one's commitment to protecting, for all individuals, these fundamental human rights.